Thank you for submitting your details! You will receive an e-mail with the PDF very soon! Email A valid e-mail address is required. 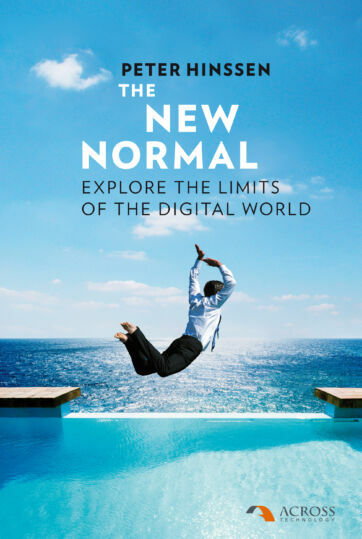 In The New Normal, Peter Hinssen presents how companies may address a society without digital limits. Quite poignantly, Peter points out that organizations are increasingly faced with customers and consumers who no longer tolerate limitations in terms of pricing, timing, patience, depth, privacy, convenience, intelligence. A number of new rules will apply in the New Normal. Consumers will have zero tolerance for digital failure. They will expect to get internet access anytime, anyplace. Internet and connectivity will be just as ubiquitous as electricity. Consumers will demand fulfillment of their information needs instantaneously. The effect on companies will be tremendous. They were just getting used to coping with a 24 hour economy, and now they will have to cope with the ‘experience economy’: customers will demand interaction with providers of services and products on their conditions. They will expect the digital user experience to be easy and interesting. Every interaction with a customer must be viewed as a ‘make or break’ moment for the relationship with the customer. IT departments too will have to adopt a new way of working. They will have to react more flexible to the demands of the business side of the company. IT-departments were used to build big systems, now they will have to create small, flexible structures that can be adapted quickly. They no longer have to build pyramids, they must put up tents instead. "This is the first book about technology that is not boringly technical. Peter Hinssen success in making clear what the fast and complex ICT innovations will mean to society and does so in a clear, relaxing and sometimes hilarious way. Peter is one of the rare European experts who is regarded as a worldwide reference. If you read the book, you will understand why." "I am impressed about your book! I like your way of thinking and the ease with which you transmit such destabilizing ideas to practical people who need to act on them. I learned about some consequences of the “new normal” that I hadn’t thought about and I learned ways of conveying some that I thought about. And on top of that… I enjoyed it!" "The impact of the digital revolution on our lives amounts to a Copernican revolution. We have difficulty in understanding exactly what that means. Peter Hinssen allows the reader a view from the barricades. I recommend this book." "Technological innovation is the way forward. In The New Normal, Peter Hinssen describes what the journey will be like, with thrilling examples and real-life stories."